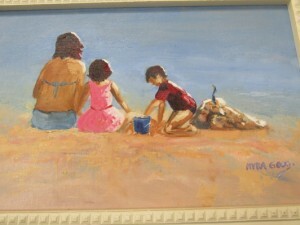 Painting by Artist of the Month, Myra Good. October features the works of John and Myra Good. Myra has been painting since 1999, originally in acrylics but moving on to works in oils. Her preferred subject matter is seascapes, abstract landscape, flowers and figures. Her works often include figures, children with their mothers by the seaside or in country scenes. John has held a lifetime interest in art to which he credits his father with planting the seed. Originally from Melbourne, John began to paint after moving to Qld. His subject matter is drawn from his travels between the two States, during which he has searched out new and varied coastal and bush scenery. Please come visit the Dayboro Community Art Gallery and support our Artist of the Month for October.